Hi. Webmaster Richard here. Thought some of you might be interested in this recent experience of mine, so I'm calling it a "review" and publishing it here. I was at one of my suppliers' shops about a week ago, and I picked up an OEM (Original Equipment Manufacturer) copy of Linspire (formerly "Lindows"). The OEM package consists of two CD's. One is the installer, and the other is a "live" version of Linspire (meaning that it runs off the CD without having to be installed on the hard drive). A couple of days later, I threw together a "new" box (just what I need -- yet another Linux box) using a combination of old and new parts, including a $59.95 DFI mobo with integrated everything (except video) that was in the clearance bin at a local computer shop, an AMD Sempron 2500+ CPU, 512 MB of used PC-2100 DDR-SDRAM I had laying around my office, a used case, an old Nvidia video card salvaged from a customer's discarded PC, and a new 80 GB Samsung hard drive. Then I sat down to watch the Yankee game, popped the Linspire installation CD in the tray, and booted up the machine. Based on previous Linux installations (and because admittedly I had done almost zero research on hardware compatibility with Linspire before building this particular box, except for checking the CPU and RAM requirements), I figured I'd be spending about an hour answering arcane questions about filesystems, partitions, and dependencies, and then waiting for files to be copied. Then I figured I'd spend about another week searching for drivers for my mobo and all of its integrated devices, probably with a kernel rebuild thrown in just for good measure. What hard drive should Linspire install to? Did I want Linspire to completely take over that hard drive? What did I want the admin password to be? Was I sure that I wanted Linspire to take over the hard drive? After entering the requisite answers, the CD launched into a little Windows 98-esque installation routine extolling the virtues of Linspire. Seven minutes later (yes, I said seven minutes later), the installation was finished. Hardware-wise, everything was detected properly and automatically configured, including the Internet connection. Everything worked: NIC, audio, USB, everything. Even my USB Jump Drive worked perfectly. The only problem was with the Nvidia video card, which I think was a hardware problem (streaking horizontal lines). Hey, it was salvaged from a trashed computer, after all. So I shut down, pulled the Nvidia card, popped in an old ATi Rage card, and booted into the built-in "redetect" mode. The change was automatically detected and the new card configured. Now mind you, the Linspire OEM version doesn't come with very much software. It has, I would say, slightly more than what would be found on a Windows XP CD (in Linux equivalents, of course). There's a Web browser, a multi-protocol chat client, an email client, a few games, a few utilities, a few desktop applications, and so forth. Pretty much what you would expect from an OEM operating system disk. But for an additional $49.95, you can buy a membership in the CNR Warehouse. (A one-year membership is included in some of the retail versions of Linspire, but not the OEM version.) The CNR Warehouse has almost two thousand apps available for immediate download, most of which are free to members. Most of it is open-source stuff which could be had for free anyway, but the difference is that Linspire has this stupid simple one-touch installer system called CNR ("Click-N-Run"). CNR literally installs the programs with a click of a mouse. You click on this green icon of a guy running, and the program installs over the Internet. Silently. No compiling binaries. No extracting tarballs and gzips. No worrying about dependencies. No nothing. Just click the little running guy, and the program downloads and silently installs itself while you browse the aisles. What a pleasure -- at least if you are on broadband. 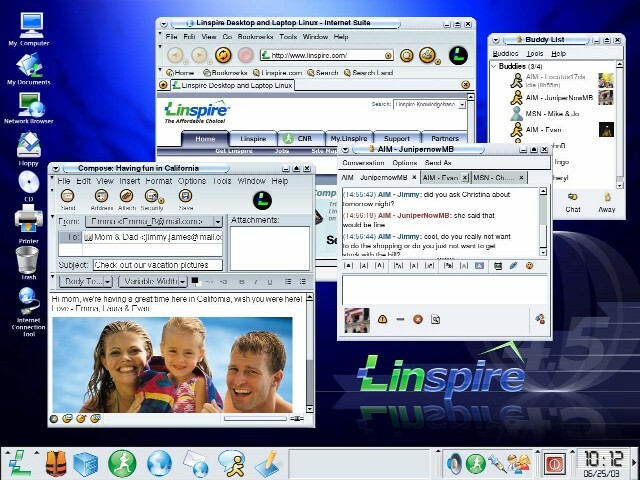 Linspire also recognized my Windows network and painlessly set up the necessary services to enable file sharing between the Windows and Linux machines, once I told it to do so. This took about two minutes. I must say, I've used a lot of Linuxes, and this one is undoubtedly the easiest one I've seen. It's probably not a system for someone who wants to "learn Linux" because it is so decidedly un-Linux like. In fact, I had to look around for a command terminal. They seem to hide it. So for someone who wants to learn command-line Linux, this may not be the distro of choice. But as a solution for someone who needs a dependable, low-priced, malware-resistant workstation, and who is not handcuffed to Windows applications, Linspire seems like a great deal. The $49.95 CNR Warehouse membership entitles a Linspire user to software whose Windows equivalents would cost hundreds or thousands of dollars. Linspire does require decent, though not bleeding-edge hardware. It wants at least an 800 MHz CPU and 256 MB of RAM. That's kinda high for minimum system requirements compared to most other Linux distributions. But it's still low enough that you can save a ton of money by buying, say, a year-old mobo bundled with a 2 GHz processor, and still wind up with a fast, stable machine. In summary, I'm very, very impressed with Linspire. This is a Linux that seems to be every bit as easy to use as Windows, but with the stability, security, and reliability of Linux behind it.